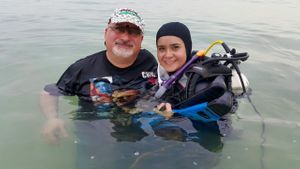 In February 2015, my beloved wife Ola Mostafa Khalaf visited the Reef Dive Resort at the Mataking Island, Sabah, Malaysia, during the Sheikh Hamdan Bin Mohammed Bin Rashid Al Maktoum International Photography Awards (HIPA) Expedition to the Mataking Island. 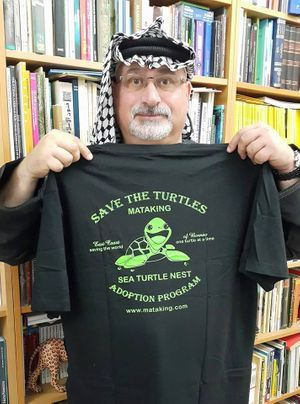 My wife Ola Khalaf visited the Mataking Island Reef Turtle Hatchery, and made for me the most precious present. 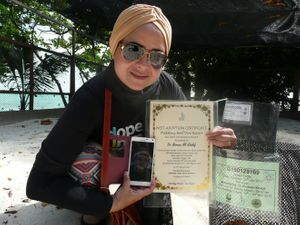 A Green Sea Turtle Nest Adoption Certificate as part of the Sea Turtle Conservation Project. 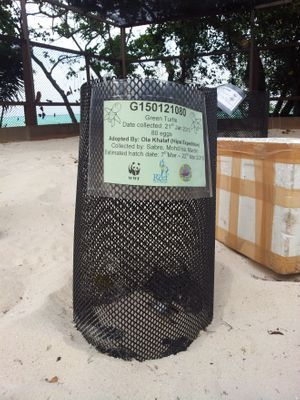 My Green Sea Turtle nest with the code number G150129169 was collected on 29th January 2015 by Sabre, Mardin and Mohd Isa with 169 Green Sea Turtle eggs. 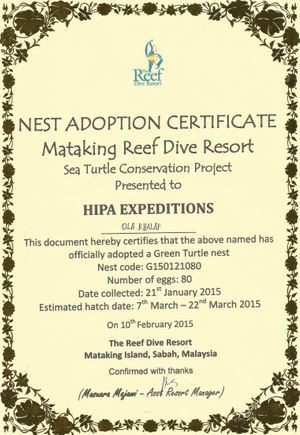 The estimated hatch date was 15th – 30th March 2015. 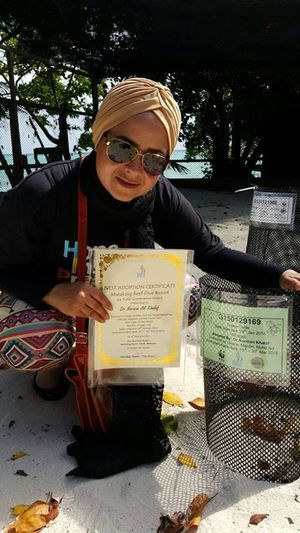 My wife Ola Khalaf has won a Green Turtle Nest Adoption Certificate (Nest code G150121080) during a local meal cooking competition. Her Nest consisted of 80 eggs; and it was collected on 21st January 2015; and the first successful hatch was on 19th February 2015. 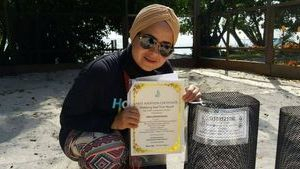 The Green Sea Turtle Conservation Project is also funded by the WWF as part of protecting these endangered creatures from extinction. زارت زوجتي الغالية عُلا مُصطفى خلف في فبراير 2015 ضمن وفد جائزة الشيخ حمدان بن محمد بن راشد آل مكتوم الدولية للتصوير الضوئي ، مُنتجع الغوص في الشعاب المُرجانية في جزيرة ماتاكينج ، ولاية صباح ، ماليزيا . وقامت هناك بزيارة مكان تفريخ بيض السلاحف البحرية الخضراء ؛ وقد قامت بإهدائي عُشاً لبيض السلاحف البحرية الخضراء المُعرضة لخطر الإنقراض في محمية السلاحف البحرية على شاطئ جزيرة ماتاكينج ، ويتكون العُش من 169 بيضة تم جمعها في 29 يناير 2015 وستفقس بإذن الله ما بين 15 - 30 مارس 2015 . هذا وقد فازت زوجتي الحبيبة عُلا خلال مُسابقة إعداد الطعام المحلي في جزيرة ماتاكينج الماليزية ، بشهادة تبني عُشاً لبيض السلاحف البحرية الخضراء ، تم جمعها يوم 21 يناير 2015 ، وتضم 80 بيضة . وقد فقست أول 12 بيضة في يوم 19 فبراير 2015 . ويأتي برنامج تبني أعشاش بيض السلاحف البحرية الخضراء من ضمن برنامج عالمي خاص يدعمه الصندوق الدولي لحماية الطبيعة من أجل حمابة هذه الزواحف البحرية من خطر الإنقراض . The Green Sea Turtle (Chelonia mydas Linnaeus, 1758), also known as the Green Turtle, Black (Sea) Turtle, or Pacific Green Turtle, is a large sea turtle of the family Cheloniidae. It is the only species in the genus Chelonia. Its range extends throughout tropical and subtropical seas around the world, with two distinct populations in the Atlantic and Pacific Oceans. The common name comes from the usually green fat found beneath its carapace (Wikipedia). This sea turtle's dorsoventrally flattened body is covered by a large, teardrop-shaped carapace; it has a pair of large, paddle-like flippers. It is usually lightly colored, although in the eastern Pacific populations parts of the carapace can be almost black. Unlike other members of its family, such as the hawksbill sea turtle (Eretmochelys imbricata), C. mydas is mostly herbivorous. 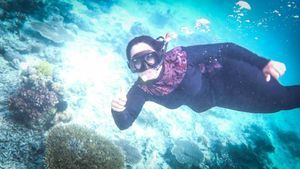 The adults usually inhabit shallow lagoons, feeding mostly on various species of seagrasses (Wikipedia). Like other sea turtles, green sea turtles migrate long distances between feeding grounds and hatching beaches. Many islands worldwide are known as Turtle Island due to green sea turtles nesting on their beaches. Females crawl out on beaches, dig nests and lay eggs during the night. 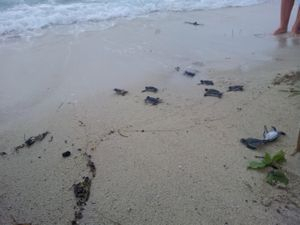 Later, hatchlings emerge and scramble into the water. Those that reach maturity may live to eighty years in the wild (Wikipedia). Chelonia mydas is listed as endangered by the IUCN and CITES and is protected from exploitation in most countries. It is illegal to collect, harm or kill them. In addition, many countries have laws and ordinances to protect nesting areas. However, turtles are still in danger due to human activity. 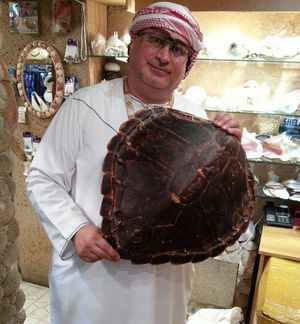 In some countries, turtles and their eggs are hunted for food. Pollution indirectly harms turtles at both population and individual scales. Many turtles die caught in fishing nets. Also, real estate development often causes habitat loss by eliminating nesting beaches (Wikipedia). The green sea turtle is a member of the tribe Chelonini. A 1993 study clarified the status of genus Chelonia with respect to the other marine turtles. The carnivorous Eretmochelys (Hawksbill), Caretta (Loggerhead) and Lepidochelys (Ridley) were assigned to the tribe Carettini. Herbivorous Chelonia warranted their status as a genus, while Natator (Flatback) was further removed from the other genera than previously believed (Wikipedia). The species was originally described by Linnaeus in 1758 as Testudo mydas. In 1868, Marie Firmin Bocourt named a particular species of sea turtle Chelonia agassizii. This "species" was referred to as the "black sea turtle". Later research determined Bocourt's "black sea turtle" was not genetically distinct from Chelonia mydas, and thus taxonomically not a separate species. 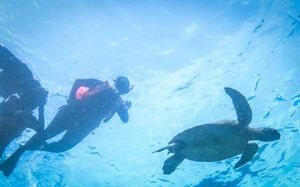 These two "species" were then united as Chelonia mydas and populations were given subspecies status: C. mydas mydas referred to the originally described population, while C. mydas agassizii referred only to the Pacific population known as the Galápagos green turtle. This subdivision was later determined to be invalid and all species members were then designated Chelonia mydas. The oft-mentioned name Chelonia agassizii remains an invalid junior synonym of C. mydas (Wikipedia). The species' common name does not derive from any particular green external coloration of the turtle. Its name comes from the greenish color of the turtles' fat, which is only found in a layer between their inner organs and their shell. As a species found worldwide, the green turtle is called differently in some languages and dialects. In the Hawaiian language, honu is used to refer to this species (Wikipedia). Adult green sea turtles mostly eat marine plant life such as kelp and algae, while juveniles have a more carnivorous diet (Wikipedia). Its appearance is that of a typical sea turtle. Chelonia mydas has a dorsoventrally flattened body, a beaked head at the end of a short neck, and paddle-like arms well-adapted for swimming. Adult green turtles grow to 1.5 metres (5 feet) long. The average weight of mature individuals is 68–190 kg (150–419 lb) and the average carapace length is 78–112 cm (31–44 in). Exceptional specimens can weigh 315 kg (694 lb) or even more, with the largest known C. mydas having weighed 395 kg (871 lb) and measured 153 cm (60 in) in carapace length (Wikipedia). Anatomically, a few characteristics distinguish the green turtle from the other members of its family. Unlike the closely related hawksbill turtle, the green turtle's snout is very short and its beak is unhooked. The sheath of the turtle's upper jaw possesses a denticulated edge, while its lower jaw has stronger, serrated, more defined denticulation. The dorsal surface of the turtle's head has a single pair of prefrontal scales. Its carapace is composed of five central scutes flanked by four pairs of lateral scutes. Underneath, the green turtle has four pairs of inframarginal scutes covering the area between the turtle's plastron and its shell. Mature Chelonia mydas front appendages have only a single claw (as opposed to the hawksbill's two), although a second claw is sometimes prominent in young specimens (Wikipedia). The carapace of the turtle has various color patterns that change over time. Hatchlings of Chelonia mydas, like those of other marine turtles, have mostly black carapaces and light-colored plastrons. Carapaces of juveniles turn dark brown to olive, while those of mature adults are either entirely brown, spotted or marbled with variegated rays. Underneath, the turtle's plastron is hued yellow. Chelonia mydas limbs are dark-colored and lined with yellow, and are usually marked with a large dark brown spot in the center of each appendage (Wikipedia). The range of the green sea turtle extends throughout tropical and subtropical oceans worldwide. There are two major subpopulations, the Atlantic and the eastern Pacific subpopulations. Each population is genetically distinct, with their own set of nesting and feeding grounds within the population's known range (Wikipedia). The green sea turtle can generally be found throughout the Atlantic Ocean. Individuals have been spotted as far north as Canada in the western Atlantic, and the British Isles in the east. The subpopulation's southern range is known until past the southern tip of Africa in the east and Argentina in the western Atlantic. The major nesting sites can be found on various islands in the Caribbean, along the eastern shores of the continental United States, the eastern coast of the South American continent and most notably, on isolated North Atlantic islands (Wikipedia). In the Caribbean, major nesting sites have been identified on Aves Island, the U.S. Virgin Islands, Puerto Rico, and Costa Rica. In recent years there are signs of increased nesting in the Cayman Islands. One of the region's most important nesting grounds is in Tortuguero in Costa Rica. In fact, the majority of the Caribbean region's Chelonia mydas population hails from a few beaches in Tortuguero. Within United States waters, minor nesting sites have been noted in the states of Georgia, North Carolina, South Carolina, and all along the east coast of Florida. Hutchinson Island in particular is a major nesting area in Florida waters. Notable locations in South America include secluded beaches in Suriname and French Guiana. In the Southern Atlantic Ocean, the most notable nesting grounds for Chelonia mydas are found on the island of Ascension, which hosts 6,000–13,000 turtle nests (Wikipedia). In contrast with the sporadic distribution of nesting sites, feeding grounds are much more widely distributed throughout the region. Important feeding grounds in Florida include Indian River Lagoon, the Florida Keys, Florida Bay, Homosassa, Crystal River, and Cedar Key (Wikipedia). In the Pacific, its range reaches as far north as the southern coast of Alaska and as far south as Chile in the east. The turtle's distribution in the western Pacific reaches north to Japan and southern parts of Russia's Pacific coast, and as far south as the northern tip of New Zealand and a few islands south of Tasmania. The turtles can be found throughout the Indian Ocean (Wikipedia). Significant nesting grounds are scattered throughout the entire Pacific region, including Mexico, the Hawaiian Islands, the South Pacific, the northern coast of Australia, and Southeast Asia. Major Indian Ocean nesting colonies include India, Pakistan, and other coastal countries. The east coast of the African continent hosts a few nesting grounds, including islands in the waters around Madagascar (Wikipedia). Nesting grounds are found all along the Mexican coast. These turtles feed in seagrass pastures in the Gulf of California. Green turtles belonging to the distinct Hawaiian subpopulation nest at the protected French Frigate Shoals some 800 kilometers (500 mi) west of the Hawaiian Islands. In the Philippines, green turtles nest in the Turtle Islands along with closely related hawksbill turtles. 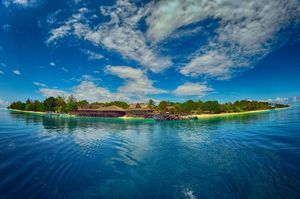 Indonesia has a few nesting beaches, one in the Meru Betiri National Reserve in East Java. 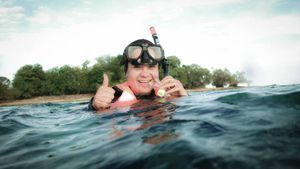 The Coral Sea has nesting areas of world significance. 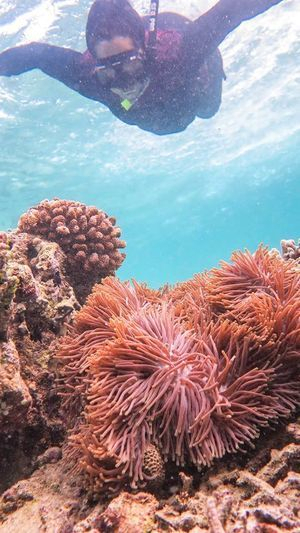 The Great Barrier Reef has two genetically distinct populations; one north and one south. 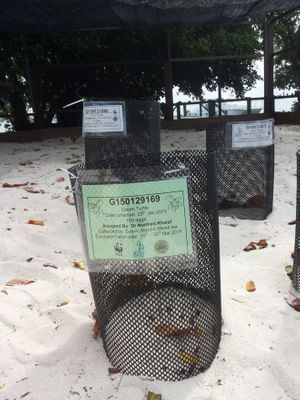 Within the reef, twenty separate locations consisting of small islands and cays were identified as nesting sites for either population of C. mydas. Of these, the most important is on Raine Island. Major nesting sites are common on either side of the Arabian Sea, both in Ash Sharqiyah, Oman, and along the coast of Karachi, Pakistan. Some specific beaches there, such as Hawke's Bay and Sandspit, are common to both Chelonia mydas and the olive ridley sea turtle (Lepidochelys olivacea) subpopulation. Sandy beaches along Sindh and Balochistan are nesting sites. Some 25 kilometers (16 mi) off the Pakistani coast, Astola Island is another nesting beach (Wikipedia). Other nesting areas are on the sandy beaches and islands of the United Arab Emirates and Kuwait in the Arabian/Persian Gulf. On 30 December 2007, fishermen using a hulbot-hulbot (a type of fishnet) accidentally caught an 80 kg (180 lb), 93 cm (37 in) and 82 cm (32 in) wide, turtle off Barangay Bolong, Zamboanga City, Philippines. 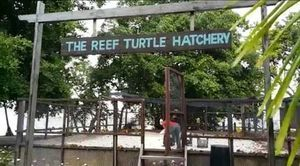 December is breeding season near the Bolong beach (Wikipedia). As one of the first sea turtle species studied, much of what is known of sea turtle ecology comes from studies of green turtles. The ecology of Chelonia mydas changes drastically with each stage of its life history. Newly emerged hatchlings are carnivorous, pelagic organisms, part of the open ocean mini-nekton. In contrast, immature juveniles and adults are commonly found in seagrass meadows closer inshore as herbivorous grazers (Wikipedia). Green sea turtles move across three habitat types, depending on their life stage. They lay eggs on beaches. Mature turtles spend most of their time in shallow, coastal waters with lush seagrass beds. 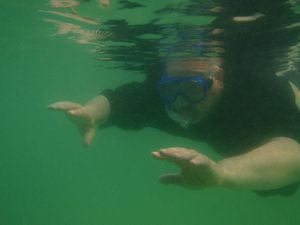 Adults frequent inshore bays, lagoons and shoals with lush seagrass meadows. Entire generations often migrate between one pair of feeding and nesting areas (Wikipedia). Turtles spend most of their first five years in convergence zones within the bare open ocean that surround them. These young turtles are rarely seen as they swim in deep, pelagic waters. Green sea turtles typically swim at 2.5–3 km/h (1.6–1.9 mph) (Wikipedia). Only human beings and the larger sharks feed on Chelonia mydas adults. Specifically, tiger sharks (Galeocerdo cuvier) hunt adults in Hawaiian waters. Juveniles and new hatchlings have significantly more predators, including crabs, small marine mammals and shorebirds. In Turkey, their eggs are vulnerable to predation by red foxes and golden jackals (Wikipedia). 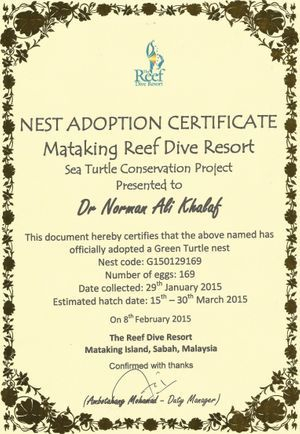 At Ras Al-Hadd Nature Reserve in Oman, green turtles Chelonia mydas nest year round, with a distinct lower-density nesting season from October to May, and a higher-density nesting season from June to September. On these beaches, the main predators of turtle eggs and hatchlings are foxes Vulpes spp. (Vulpes vulpes arabica, Vulpes rueppellii sabaea, and Vulpes cana), wolves Canis lupus arabs, and wild cats Felis spp. and Caracal caracal schmitzi (Mendonça, Al Saady, Al Kiyumi and Erzini, 2010). 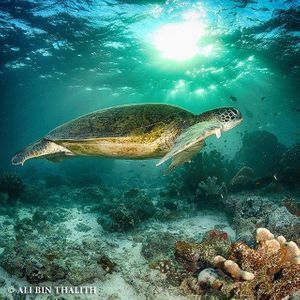 Green sea turtles migrate long distances between feeding sites and nesting sites; some swim more than 2,600 kilometres (1,600 mi) to reach their spawning grounds. Mature turtles often return to the exact beach from which they hatched. Females usually mate every two to four years. Males, on the other hand, visit the breeding areas every year, attempting to mate. Mating seasons vary between populations. For most C. mydas in the Caribbean, mating season is from June to September. The French Guiana nesting subpopulation nests from March to June. In the tropics, green turtles nest throughout the year, although some subpopulations prefer particular times of the year. 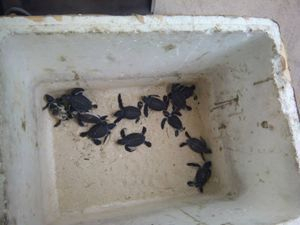 In Pakistan, Indian Ocean turtles nest year-round, but prefer the months of July to December (Wikipedia). The mating of green sea turtles is similar to other marine turtles. Female turtles control the process. A few populations practice polyandry, although this does not seem to benefit hatchlings. After mating in the water, the female moves above the beach's high tide line, where she digs a hole with her hind flippers and deposits her eggs. Clutch size depends on the age of the female and species, but can range between 100 and 200. She then covers the nest with sand and returns to the sea (Wikipedia). At around 100 to 150 days, the eggs hatch during the night, and the hatchlings instinctively head directly into the water. This is the most dangerous time in a turtle's life. As they walk, predators, such as gulls and crabs, feed on them. A significant percentage never makes it to the ocean. 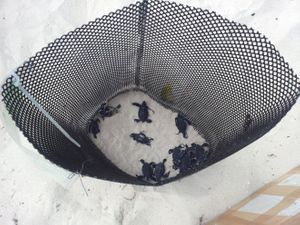 Little is known of the initial life history of newly hatched sea turtles. Juveniles spend three to five years in the open ocean before they settle as still-immature juveniles into their permanent shallow-water lifestyle. It is speculated that they take twenty to fifty years to reach sexual maturity. Individuals live up to eighty years in the wild. It is estimated that only 1% of hatchlings reach sexual maturity (Wikipedia). Each year on Ascension Island in the South Atlantic, Chelonia mydas females create 6,000 to 25,000 nests. They are among the largest green turtles in the world; many are more than a metre in length and weigh up to 300 kilograms (660 lb) (Wikipedia). Sea turtles spend almost all their lives submerged, but must breathe air for the oxygen needed to meet the demands of vigorous activity. With a single explosive exhalation and rapid inhalation, sea turtles can quickly replace the air in their lungs. 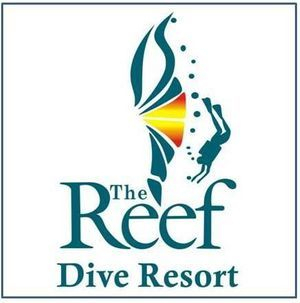 The lungs permit a rapid exchange of oxygen and prevent gases from being trapped during deep dives. Sea turtle blood can deliver oxygen efficiently to body tissues even at the pressures encountered during diving. During routine activity, green and loggerhead turtles dive for about four to five minutes, and surface to breathe for one to three seconds (Wikipedia). Turtles can rest or sleep underwater for several hours at a time, but submergence time is much shorter while diving for food or to escape predators. 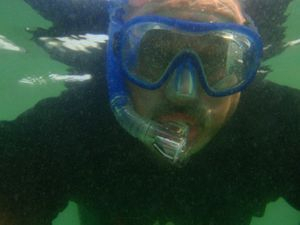 Breath-holding ability is affected by activity and stress, which is why turtles quickly drown in shrimp trawlers and other fishing gear (Wikipedia). Khalaf, Norman Ali Bassam (1980). Tabie’t Al-Talawon fi Al-Haywanat (The Colouration of Animals). Al-Biology Bulletin. Number 1. January 1980, Safar 1401. Biological Society, Kuwait University, State of Kuwait. pp. 4-5. (In Arabic). Khalaf, Norman Ali (1983). 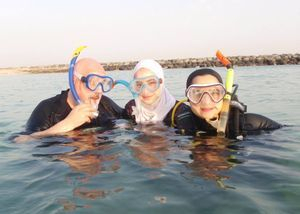 Al-Hayat Al-Bahriyah fi Al-Kuwait (Sea Snakes in Kuwait). Bulletin of the Biological Studies Club, Kuwait University, State of Kuwait. First Year, Number 4, (07.12.1983), pp. 1-5 (In Arabic). Khalaf, N.A.B. (1986). The Schooling of Sumatra Barbs (Barbus tetrazona tetrazona) and Minnows (Phoxinus phoxinus). Dissertation, Master of Science in Ecology, Departments of Zoology and Botany, University of Durham, England. September 1986. pps. 59 + iv. Khalaf-von Jaffa, Norman Ali Bassam (1991). A Trip to Zoo Budapest, Hungary. Gazelle: The Palestinian Biological Bulletin. Bonn-Bad Godesberg, Federal Republic of Germany. Number 21, Ninth Year, January 1991. pp. 1-4. Khalaf-von Jaffa, Norman Ali Bassam (1992). An Introduction to the Animal Life in Palestine. Gazelle. Gazelle: The Palestinian Biological Bulletin. Bonn-Bad Godesberg, Federal Republic of Germany. Number 30, Tenth Year, October 1992. pp. 1-7. (In Arabic). Khalaf-von Jaffa, Norman Ali Bassam (1994). An Introduction to the Animal Life in Palestine. Shqae’q Al-Nouma’n (Anemone coronaria). A Quarterly Magazine Issued by the Program EAI (Education for Awareness and for Involvement). 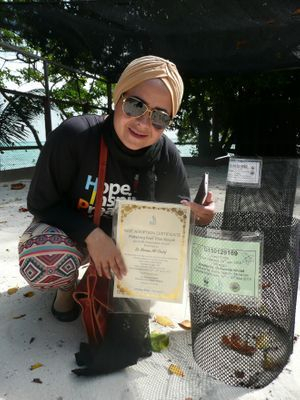 Environmental Education / Children for Nature Protection. In Cooperation with Dept. of General and Higher Education. P.L.O., Palestine. Number 4. Huzairan (June) 1994. pp. 16-21. (In Arabic). Khalaf-von Jaffa, Norman Ali (2005). Jaffa (Yaffa): The History of an Old Palestinian Arab City on the Mediterranean Sea. Gazelle: The Palestinian Biological Bulletin. Sharjah, United Arab Emirates. Number 39, Twenty-third Year, March 2005. pp. 7-8. Khalaf-von Jaffa, Norman Ali (2005). The Andromeda Sea Monster of Jaffa. Gazelle: The Palestinian Biological Bulletin. Sharjah, United Arab Emirates. Number 39, Twenty-third Year, March 2005. pp. 8. Khalaf-von Jaffa, Norman Ali (2005). The Rafah Zoo in the Rafah Refugee Camp, Gaza Strip, Palestine : A Story of Destruction by the Israeli Occupation Army. Gazelle: The Palestinian Biological Bulletin. Number 46, Twenty-third Year, October 2005, Ramadan 1426. pp. 1-11. Sharjah, United Arab Emirates. (In Arabic). Khalaf-von Jaffa, Norman Ali Bassam (2005). The Qalqilia Zoo and the Natural History Museum in the City of Qalqilia, West Bank, Occupied Palestine. Gazelle: The Palestinian Biological Bulletin. Number 47, Twenty-third Year, November 2005, Shawal 1426. pp. 1-10. Sharjah, United Arab Emirates. (In Arabic).